Toyota are promoting the solar energy features of the 3rd generation Prius through the medium of giant wifi sun flowers! The oversized flower sculptures are partially powered by solar panels on the back of their petals and the base of their stems. 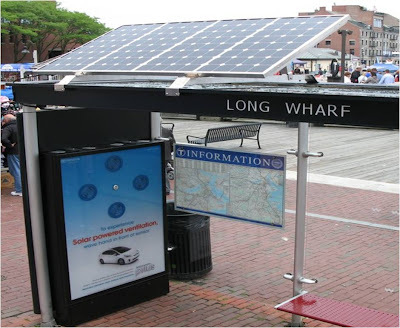 Each of the five Solar Flowers provides seating for up to 10 people, access to free Wi-Fi service and power to charge cell phones and laptops. Daily hours of operation are 0800 – 2100. 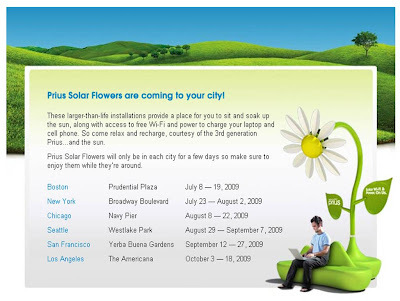 The first stop on the Prius Solar Flower tour is Boston where the Solar Flowers can be experienced in Prudential Plaza until 19th July. Toyota also installing solar ventilation bus shelters throughout the city to further promote the solar features of the new Prius. The Prius Solar Flower activity is an extension of the recent TV campaign that promotes "Harmony, where man's wants and nature's needs agree." The Prius Solar Flowers are a nice way of extending the mass communication delivered through the TV ad. 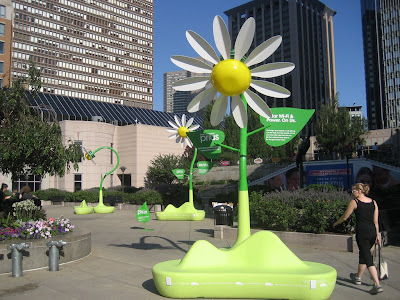 The Solar Flowers follow the Harmony theme, whilst promoting discussion by being both eye-catching and useful! 'In My Prius' - Gangster Rap Prius parody set to go viral?